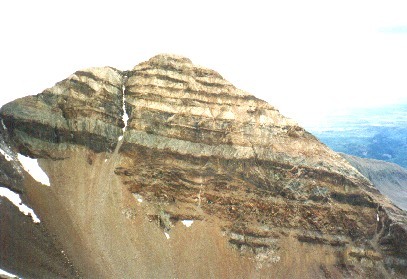 the northern mountain of the Diné mandala. 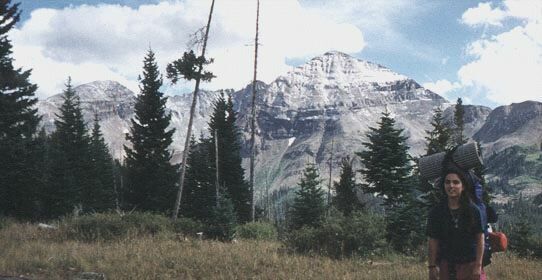 The peak to the far left, is Centennial (13,062). 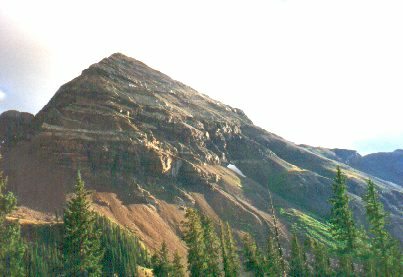 Common throughout the San Juans, acres of shattered rock form 'rock glaciers.' 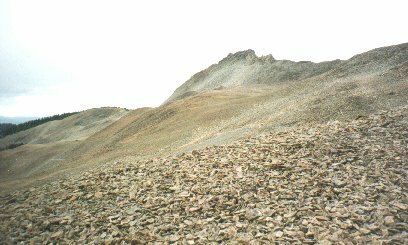 Low ridges of these rocks creep downhill, slowly flowing out of glaciated cirques. Some rock glaciers have been found to possess a core of ice. reveals stratified beds of Pennsylvanian (286-320 my) and Permian (245-286 my) age. In the distance is the Four Corners area of the San Juan Basin. The name comes from the Greek word for the evening star. The Navajo call it Dibenitsaa which translates as Big Mountain Sheep. Dibenitsaa lies in the northern quadrant of their mandala, fastened to earth with a rainbow, covered with a blanket of darkness, decorated with obsidian and black beads, black vapours and different plants and animals. Upon the peak is an obsidian basket holding two blackbird eggs covered with sacred buckskin. These birds will provide black feathers. Lightning was sent to guard the doorway of Jet Boy/Pollen Boy and Grasshopper Girl in the north.